We welcome you to come in to view art, buy art and create art at our local establishment. ​Promoting art appreciation in the community through classes, workshops and exhibits. 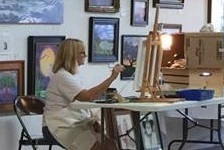 ﻿Llano Fine Art Guild is a non profit guild of individuals working together to promote artists and their work, art programs and art education in the community. Everything we do is through volunteer effort on behalf of our art community. Monthly Art Demos! Best value in town! Think you're not creative? Read this! Then join one of our art activities! Guild Artists volunteer at the gallery so drop by, see who's there and say hello. New lower commission on Associate Memberships. New Consignment Artist Non-Member category has been added. The gallery is located in historic Llano, Texas on Hwy 16 north of the Inks Bridge. Look for the red building with the green doors. Enter into the Gallery or the Guild to find a wide variety of original artwork. The Llano Fine Art Guild is a non-profit 501c3 organization. We are a member of the Llano Chamber of Commerce.